I’m a big fan of coffee cake – I never developed the taste for coffee, but I’m all about the cakes that go with it. My predilection may be because coffee cakes are full of all the fattening things in life, like butter and sour cream or cream cheese – and don’t contain coffee. Throw some fat into a sweet, tender cake, and I’ll be right over. I apologize for the picture here – I made this cake for a birthday gathering at work, and forgot to take a picture before I left home. 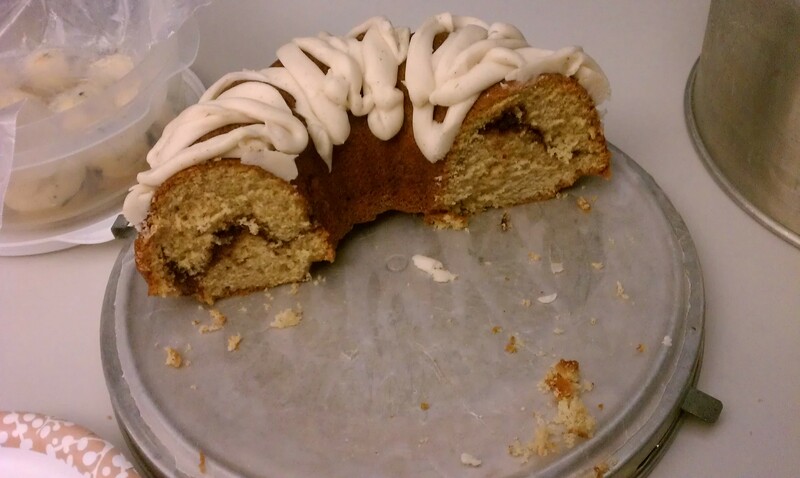 By the time I remembered at the office, this is what was left, which I think means it turned out well – despite us all. You would think grown, employed people would remember when someone says, “I’m taking Monday off for my birthday.” But no, we all had our treats for our gathering made for a Monday morning meeting, to which the intended recipient was not present. I suppose the good news is we all managed to remember over a weekend to bring treats on Monday morning. Despite the lovely cookies, muffins and cake staring at us on Monday morning, we shamed one another into abstaining until Tuesday. I’d call it willpower, but we all know it was group shaming. Nobody wanted to be “that person,” the one that cut the cake, took a muffin, or messed up the pretty cookie display before the recipient got to see them. So the cake sat from Sunday evening to Tuesday morning. I was afraid it would dry out, even in my 50-year-old covered cake-taker, but I’m happy to report it stayed moist and tasty. Oh, by the way, did you know that National Coffee Cake Day is April 7th? Yeah, I didn’t either. But I have since learned that National Coffee Cake Day is sandwiched between National Caramel Popcorn Day on April 6th, and National Empanada Day on April 8th. And, National Sandwich Day is November 3rd. Preheat oven to 400 degrees F. Grease one 10 inch Bundt pan with a moderate amount of shortening; don’t skimp, but don’t get carried away either. Instead of powdering the surface with flour, I mixed up about two tablespoons of a cinnamon sugar blend, light on the cinnamon, and floured the pan with that. Be aware cinnamon can burn, so go light on the cinnamon on this step. Cream sugar and eggs until well blended, then add the sour cream and butter or margarine and beat well. Slowly beat in the flour, baking soda, and baking powder, mixing thoroughly. Beat in vanilla. STOP! Don’t pour it all into your pan yet! Mix the remaining 1/4 cup sugar with the cinnamon and nuts separately in a small bowl. NOW you can pour your batter – but only half! Pour half of the batter into the prepared pan. It will be thick, and you’ll need to spread it around a bit with a spatula. Once you’ve poured in half the batter, make a little trough around the middle, then sprinkle your small bowl of cinnamon, sugar, nut mixture over the entire cake. Now pour on the remaining cake batter, to cover it all up. Bake at 400 degrees F for 8 minutes, then lower your oven to 350 degrees F and bake for an additional 40 minutes. Cool on a rack until you can pick up the pan and turn it. Turn out onto a rack and continue to cool. Once thoroughly cooled, glaze with your favorite glaze. Cream all ingredients together until thoroughly incorporated and spreading consistency. Fill an icing bag, or if you’re cheap like me, a sandwich bag, snip the corner, and pipe the glaze over the cake. Store covered and be prepared for many oohh’s and aahh’s when served.